It feels like last week that I wrote a long update post regarding The Asian Apprenticeship Awards. I can’t say it’s been an easy journey but I have learnt a lot about the skills sector and more importantly through engaging with a diverse portfolio of employers, an eye opening insight into the many industries that are creating apprenticeship opportunities to address the dire skills shortages, the people driving the agenda and more importantly, the apprentices who have taken the leap of faith to take up an apprenticeship. A memorable visit was to the Royal Air Force base Cosford back in April 2017. I myself was 24 hours away from flying out to Dubai and having not packed, was already on edge. The very nature of an apprenticeship is to gain experience on the job. I certainly got experience. I saw planes. But I also a way of life for apprentices that exceeded my expectation. I saw first hand that with great career guidance, support and development, an apprenticeship would be life changing. I wouldn’t be exaggerating to say that this was a turning point for me: a job is never what it seems until you get real experience in it. Whether it be in the media industry, engineering or healthcare, there’s a whole new world to explore through apprenticeships. Or as the RAF say, it’s ‘No Ordinary Job’. 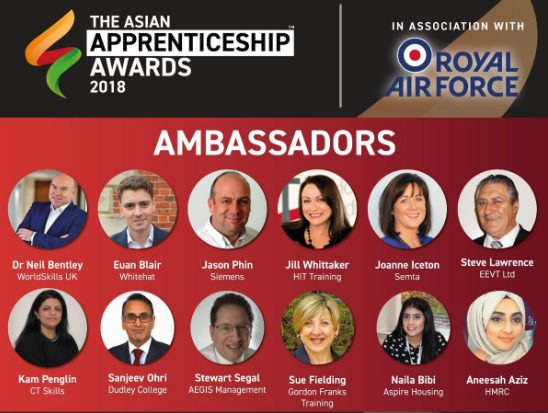 As with any journey, milestones are recognised and earlier this year, we were proud to announce that the Royal Air Force came on board as headline sponsors for the Asian Apprenticeship Awards 2018. The Asian Apprenticeship Awards has always been more than an awards ceremony. When we launched back in 2016 (which seems like a life time ago), our aim has always been to celebrate the talent and diversity of British Asian apprentices, their employers and learning providers. In doing so, our hope has been champion great role models to promote apprenticeships within ethnic minority communities. 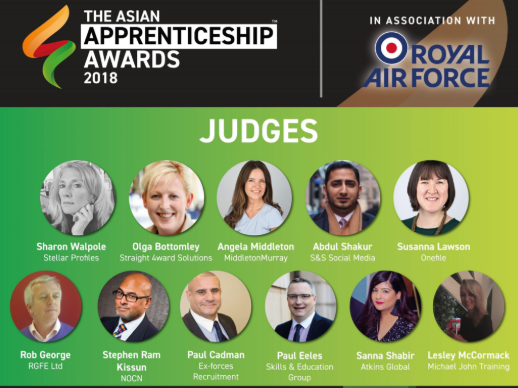 The set up of the BAME Apprenticeship Alliance has allowed us to channel the Asian Apprenticeship Awards to fit into a larger discussion around BAME diversity. Our next milestone was the Judges and Ambassadors. It’s never easy to approach someone well-known within the skills sector to take out some of their time to support you on an initiative voluntarily. However, 2018 – I am hugely proud of the team we have below. All Judges and Ambassadors bring not just a wealth of experience from the sector but their personal backing in a bid to drive the success of the awards. With the success of the first two years and having worked on the BAME Apprenticeship Alliance over the last 12 months, I’ve become exposed to many organisations willing to make a difference through recognising the need for diversity within their own organisations and beyond. Next week, I will be joining our Judge Susanna Lawson (Director of OneFile Ltd) and Yasmin Damree-Ralph (Equality and Diversity officer, BAME Apprenticeship Alliance Patron Member) to share some of the strategies that we have collectively seen work in building an effective diversity and inclusion strategy for apprenticeships. What’s important here is that we work together as a sector to address the diversity of apprenticeships. We need your support by nominating a great apprentice, their employer or learning provider. To do so, please visit the link here. Nominations are open for the following categories with a deadline of 31st July 2018. I genuinely appreciate the support from all who have followed my journey and our team over the past few years with the Asian Apprenticeship Awards and hope to share some exciting updates with you in the coming months related to the awards. If you have any questions, comments, feedback or thoughts, please do email me on isa.mutlib@pathwaygroup.co.uk. Previous Post Response to the Government’s race disparity audit. Next Post Building the brand diversity engine | The Asian Apprenticeship Awards.